Anything goes. ANYTHING. From a solo spoken word show to a company’s debut production to inspiring contemporary dance to saucy burlesque to reading a phone book aloud onstage to puppetry for all ages to stand-up comedy to a musical to a complete train wreck to the next big thing in Canadian theatre. Anything really goes (as long as it stays within the law of course!). Participants will be selected on a non-juried basis, through a first-come, first-served process, a lottery, or other method approved by the Association. The audience must have the option to pay a ticket price, 100% of which goes directly to the artists. I may be the Executive and Artistic Director of MainLine Theatre (the company that produces the Montreal Fringe), but I often refer to myself as simply the Festival Director come Fringe season. You will routinely find me overseeing operations, working on audience development or coming up with a new marketing plan. The truth is that I often feel like a protector of the festival. I’m not involved in the content of performances, I’m facilitating the conditions under which the art will hopefully thrive. I wonder: Am I influencing the curation of the festival if I visit a ton of schools to do outreach around application time? Will there be more French companies in the festival if I post on billboards in France? Is it wrong to target the application process to specific groups? Seeing as we select by lottery, will there ever be a dud Fringe, where most of the shows aren’t very good? With that in mind, it’s possible for one to be tempted to turn their back on the values of the Fringe movement. The most significant part of my job as a Fringe director is to uphold the integrity of the festival by following our national mandate and therefore protecting its values of diversity, accessibility and community. The moment a Fringe Festival anywhere starts to abandon its ideals, is the moment that festival begins to lose its authenticity. I.e., it might be easier in Montreal to acquire more funding or to sell a few more tickets if we could guarantee that every show is going to be an entertaining box office success. The challenge is to be confortable with the risk that the festival’s artistic structure creates. For years, the Montreal Fringe’s reputation in our city’s festival landscape was built on being the alternative that welcomes boldness and brass. While always being badass. When you have a festival that has over 100 productions, it’s certainly easy to rely on the productions that push the envelope to stick out of the pack. But while celebrating risk taking is an important part of what we do, the real passion I hold lies in the ideals, in that we are a part of a revolution in Canadian theatre that is gaining more and more momentum with each passing decade. VIVE LA RÉVOLUTION FRINGE ! Amy is the Executive & Artistic Director of MainLine Theatre and the St-Ambroise Montreal FRINGE Festival and the Artistic Director of the Bouge d’ici. An award-winning creator, she has produced, choreographed, performed and assisted the work of many companies, including The Montreal Highlights Festival, Kidd Pivot, Just For Laughs and RUBBERBANDance. 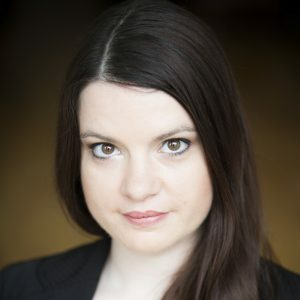 Her work has been seen in MainLine Theatre's The Mid-Life Crisis of Dionysus, MTL Shakespeare Theatre Company's Macbeth, The Rocky Horror Picture Show and Unseamly by Infinitheatre. Amy sits on the board of Quebec's English Language Arts Network.